I was given the opportunity by the nice folk at Fitness Footwear to test drive a pair of Merrell Chameleon Wrap Slam trainers. They arrived last week, and although I've not been away anywhere exciting yet to put them through their paces properly, I thought it only right to have a go at a brief "story so far" sort of thing. 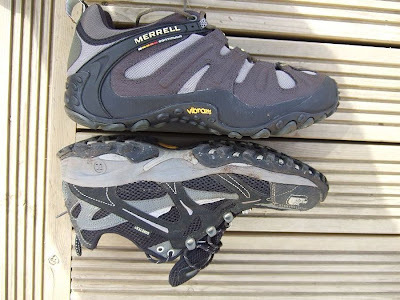 Here's your general Merrell choices, incidentally. Nae shortage of options! It's kind of running through my mind to attempt a comparison-type review. I got myself a pair of The North Face hedgehogs a couple of months back, and they were comfy enough straight out the box to make their maiden voyage on a fairly lengthy tramp to Beinn Bhrotain in the Cairngorms, so the Chameleons - or Slams as I choose to refer to them(!) have a bit to live up to. 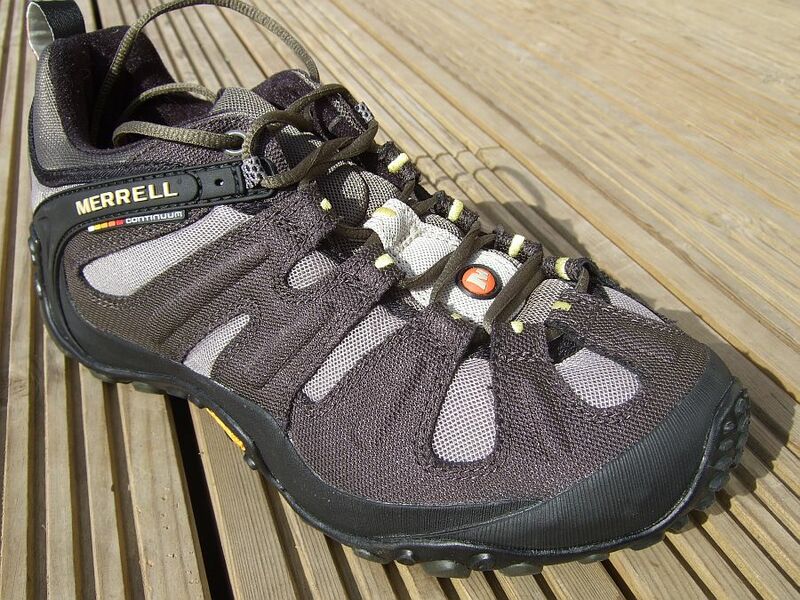 There's an obvious difference in that the Merrells aren't waterproof, but experience suggests to me that any sort of shoes tend to allow your feet to get wetter than boots and I don't regard damp feet as much of a problem in the summer anyway. With that exception I think it's a valid enough comparison. I'll report back after I get up a Munro in the Slams but here's the initial impressions. There's a lot more luxurious padding in the Merrell shoes than in the hedgehogs. Slipperesque and yet supportive was my first thought, certainly when pottering about the house. They felt like comfy trainers, as opposed to hillwalking shoes, and from the comments on the fitness footwear page a lot of folk use them as casual trainers. 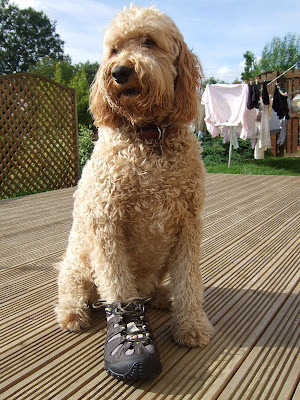 Needless to say that's ideal, as long as they stay comfy for walking up hills.Sizing takes a bit of care, it has to be said. I've got, quite frankly, a bizarre collection of sizes in outdoor footwear. My general leather winter hillwalking boots are a 10. 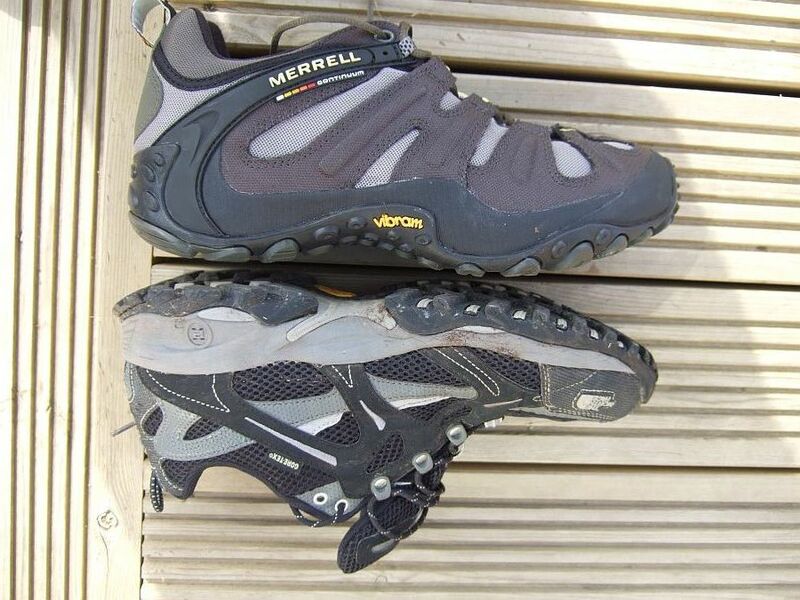 I've had various trainer type shoes and lighter "mid" boots that usually turned out to fit best in a 9 & 1/2. My full on crampon-compatible (remember those days!) real winter boots are a 9. Size 9 in the Slams was just too short. Oddly, they felt wide enough, which is often my problem with shoes, but my toes were too cramped lengthways. I'd have guessed that a half size up would have been spot on but as it turned out the 10's are a better option. The shoes definitely "hug" your feet - there's a neoprene collar which sort of pulls the tongue and sides inwards, if that makes sense - and I think this results in a wee bit more space inside being advisable. That touch of extra space no doubt adds to the "well ventilated" feeling that the manufacturers seem to be after. Note, I actually settled on that word "hug" before I read through the blurb on the Chameleon Wrap Slam page, so even if I'm having no original thoughts on the matter I can vouch for the description that's set out there. ;) Oh, and I got the "Dusty Olive" option. A better name for a colour than a snack, certainly. Maybe the huggy effect makes a half size difference? The Slams also have slightly stretchy laces, and I'm not 100% convinced I like them. Seems to make it a wee bit fiddly when you're trying to get the tension just right, particularly towards the toe end. The fabric loops the laces pass through are quite stiff, and the combination isn't maybe ideal. Having said all that, a man of 46 should really be able to tie any sort of shoelaces without too much bother, so I'd accept that it's a nitpicking observation. I'm pretty hopeful that the soles will be good out on the hill. 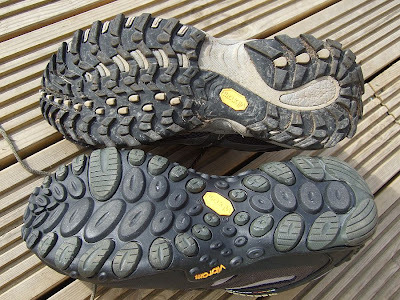 There's about the same depth of tread on the two models, but totally different tread patterns. 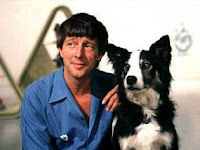 (Slam below the Hedgehog in this photie). The hedgehogs have a slightly more defined heel breast but I'll be surprised if the Slams don't cut the mustard equally well in practice. They also have a better rand/toe bumper combination than the hedgehogs so that hopefully bodes well too for rocky summits. Watch this space, as they say. At the expense of long held principles, I decided a review - particularly a comparative review - had to contain the actual weights of the shoes, and it'll no doubt be of interest to some folk to know that according to Marion's kitchen scales, one Merrell Chameleon Wrap Slam weighs 515 grammes, while the (Goretex - lined, remember) TNF Hedgehogs come in at 438 grammes each. Astounding/outrageous/irrelevant. Delete as required! "fits like a glove" ! you've got some great pictures of your dog on this site. Always nice I think to lighten up a blog page. Thanks. I'm just lucky that she seems to like getting her photo taken - it'd be awkward if she refused to sit still! I'll have you know I was positively in the vanguard of jessiehiking, having been the proud owner several years ago of a pair of Raichle trail shoes! They were of course rubbish for hillwalking in Scotland because the water got in over the top of them, and the featherweight materials didny last half a season, but they were LIGHT and that's all that matters.